The MaxiMatic EPC-808 comes in the three fashionable colors Black, Blue and Red. The 14 multifuncions are easy to use and that includes the browning and keep warm function. With the delay timer you can program this pressure cooker to start cooking later and we think this is a great feature. 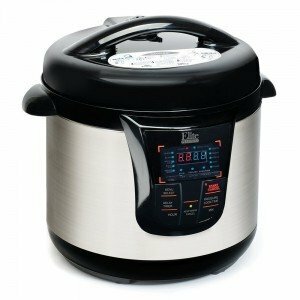 This MaxiMatic EPc-808 review will have a look at all the great features of this pressure cooker and see if they are as easy as the manufacturer claims. Digital pressure cookers are becoming more and more the norm when it comes to pressure cookers. The Cooker is 8 quarts and comes with a non stick cooking pot, but there are stainless steel cooking pots available. You can still use it for your customized cooking of course ant the cooking time can be set between o and 99 minutes. The feature that it starts up again after short power outage is something we have not seen on any other pressure cooker. The use material for the inner-pot is probably aluminum like most other pressure cookers we reviewed. We could not find it anywhere but we read that it is a very heavy pan. The lid is locked when the cooker is under pressure and can not be opened until the pressure is low enough. This is a very safe feature that does not exist on a lot of other pressure cookers. The standard pressure release valve that comes with every cooker seems to work very well according to the reviews we read. After going through a lot of comments it is not easy to come to a clear advise on the MaxiMatic EPC-80 pressure cooker. The average rating is pretty good with 4.4 but we read in the lower ratings that there were some problems and the product had to be returned a lot. Customer service also get some mixed ratings and go from great to extreme bad. It seems that this pressure cooker when it works does a great job and the feature that you can not open the lid unless the pressure is low enough is something we did not find on a lot of other pressure cookers. Our concern is the relative high number of lower reviews that complain about the cooker not working the first time or after using it a few time. This is about a 15% of the buyers and this is higher than any other product we reviewed. There should be a stainless steel inner pot available and we are looking for a link and will add it as soon as we can find it. As always we recommend that as soon as you use this pressure cooker and are not completely satisfied to send it back and ask for a replacement or your money back. The advantage of a digital electric pressure cooker over a stove top one is that you don not have to watch it and just set and forget. The epc-808 beeps when the cooking time is up and the food is ready. Most pressure cookers come with a limited cookbook and we recommend to buy at-least one good cookbook. Read all our pressure cooker reviews here.